Welcome to Plumbing Central Sydney, where our number one priority is enhancing your home through quality services. 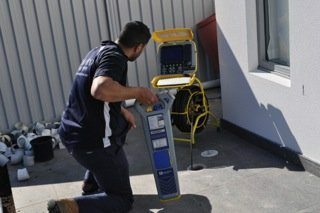 Since 2007, we have been assisting clients just like you with a wide range of commercial and residential plumbing needs in Sydney covering the suburbs from Parramatta to Peakhurst, Eastern Suburbs to Revesby, Hurstville to Bondi and throughout most of Sydney. We are driven by three central values that help us to reinvent bathrooms, unclog drains, jetblast through blockages and improve everyday life. Roselands plumber, Bill Ghany, heads the dedicated team and strives to provide quality workmanship to all – from households to big businesses. We are proud to have developed durable and effective plumbing solutions for a wide range of sites. These include schools, aged care facilities and high-risk commercial sites. We are fanatical about first-rate customer service. When you call our team you will always talk to an expert and we will turn up to your location on time, every time. Our commitment to clear communication means you will always know what needs to be done and there will never be hidden costs. We value every customer, and pride ourselves on maintaining strong relationships that are driven by results. The Plumbing Central team is deeply committed to professional development. Our team remains on the cutting edge of every technique to ensure the best solutions for you. We are also strong advocates for the Australian Apprenticeship system. We provide training opportunities for local youth through school based programs and plumbing apprenticeships. Ensuring the safety and well-being of our employees is integrated within all aspects of the business. Not only is this critically important to us, but achieving and maintaining high standards of workplace health and safety support the company’s ambitions for long-term sustainability, reputation and success. Plumbing Central strives to minimise the adverse environmental impact of our operations. We work together with our client partners, suppliers and third parties to continually improve the way we do business. Internally we have put in measures to be more energy efficient by upgrading and maintaining our fleet; and recycle base metals such as copper, brass and aluminium. Externally, the company has a strong record of delivering projects with no environmental incidents. In fact, there have never been any reportable environmental incidents in the history of the company. Plumbing Central works with client partners to save water through water efficient fixtures and water recycling through waste water treatment systems. Find out how we can help you. Explore our services or contact us to make an enquiry. Call 0410 011 999 today.